Different and new varieties of pasta are now widely available to add a bit of interest on menus. This dish uses pasta that has a nice texture to it and looks great on a plate when mixed with greens and walnuts. The butter is lightly seasoned with KNORR Concentrated Liquid Stock to add flavour and reduce the oiliness, and served over the freshly cooked pasta. Cook the pasta and strain allowing to steam off, drizzle with olive oil. Place the butter, KNORR Garlic Puree and walnuts in a pan and cook until a light brown colour, add KNORR Concentrated Liquid Stock. 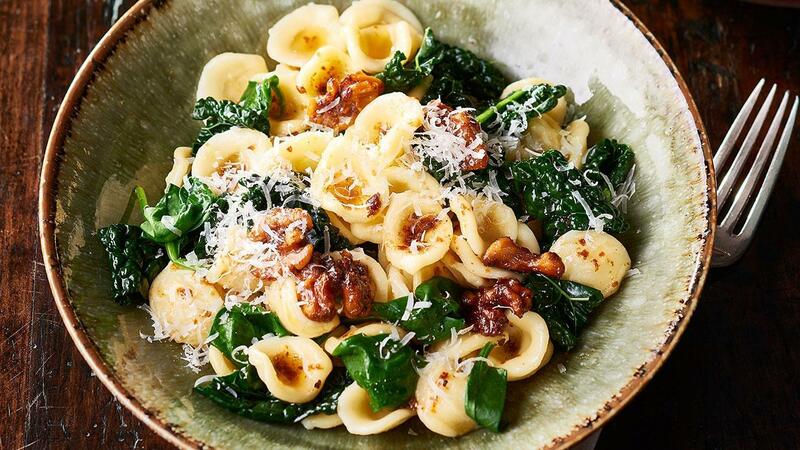 Add together the refreshed pasta, spinach and cavolo nero and toss. Serve in a shallow bowl. Drizzle with olive oil, sprinkle with cracked pepper and parmesan.